Until we do a proper site visit we can only provide you with a rough idea of what your treehouse might cost. In order for us to give the rough estimate over the phone we would require some of the following basic information: square footage, height of treehouse, how many levels, special features, photos of site/trees. If after we give you the rough estimate you would like us to visit the site we can discuss the cost for this visit. What is the cost of a treehouse? Each treehouse is different because the cost depends on the design that is created for your specific project. There are so many variables involved in determining the final cost. We work one on one with the client to design a treehouse that will fulfill their dreams and stay within their budget. 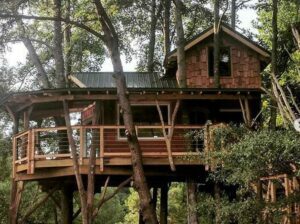 Visit our What does a treehouse cost? page for more information on pricing. Yes, we will just build an open aired deck in the trees. The pricing will depend on size, height, and trees. What states will you build in? We will build in all 50 states. We have built abroad and would look forward to doing so again. What kind of trees do you need for building a treehouse? Of course large, healthy trees are best but we have other options if needed. Tree posts can be used if the trees are not good or they are not in the proper place. Permitting varies state to state and even town to town. Some states require permits based on the size of the treehouse. You can check with your town and see what they require and any restrictions that they might impose. Clients might be able to pull their own permits but sometimes a local general contractor is needed. Can I just purchase a design from The Treehouse Guys? Yes, designs can be purchased from The Treehouse Guys. The design and site visit are a package price. Pricing will depend on complexity of design and if engineering is required. Please email us for further information. How long will it take to build my treehouse? Most treehouses take an average of 4 to 6 weeks. The time frame for building will depend on size, complexity of design and ease of access to build site. Can I have electricity? Running water? Yes, you may have electricity and running water. We are not licensed to do electrical or plumbing work so we would subcontract with a local electrician or plumber. How do I contact The Treehouse Guys? designed and built by The Treehouse Guys?